High flying Bangladesh aiming to another clean sweep as they face visiting Zimbabwe in the second and final of the two-match T20 series scheduled to be on Sunday at the Sher-e-Bangla National Cricket Stadium at Mirpur. The match kicks off at 5:00pm (BST). The first T20 on Friday is reason enough to believe that the second game on Sunday would be another close one. Zimbabwe presented a strong defence after registering a below-par score, reducing Bangladesh to 80 for five, but ultimately 131 was never a great challenge for the hosts. At the end of the game, Malcolm Waller said Zimbabwe had to make a bigger total should they bat first again, source cricket website. Bangladesh also have a few worries of their own. The Tigers started very well with the ball and although they copped some hammering from Waller in the middle overs, they also fought back well. Mashrafe Mortaza, Mustafizur Rahman and Al-Amin Hossain were disciplined and effective, reports BSS. But the batting line-up must be looked into, again. Anamul Haque was run-out, Sabbir Rahman’s promotion was a talking point while the fact that Mahmudullah and Liton Das had to deal with a late chase was a question-mark. Sabbir is a natural striker of the ball so possibly the management wanted him to take advantage of the fielding restrictions of the first six overs, but given that he is also a good runner between the wickets and has a knack of finding gaps he remains a handy option down the order. Liton and Mahmudullah couldn’t finish the job together as Mashrafe had to strike a couple of big hits to ensure the win. Zimbabwe still remain a team with iffy batting form, despite promoting Sikandar Raza up the order. But it is a positive move, one that might pay off in the second game, their last chance to redeem themselves on the tour. 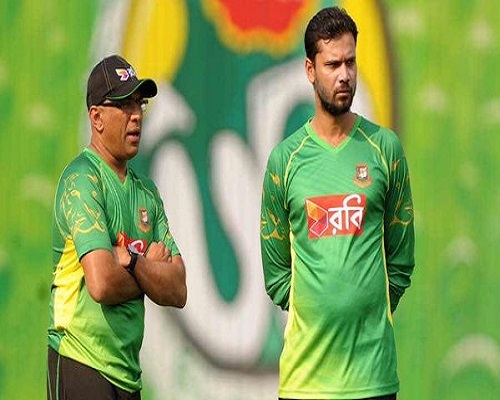 Anamul Haque is likely to get another go while Arafat Sunny and Kamrul Islam Rabbi can now expect a game too, given that Bangladesh are looking for a T20 combination suited for these conditions. On the other hand, John Nyumbu and Wellington Masakadza are still without a game, while Zimbabwe dropped Chamu Chibhabha and Taurai Muzarabani in the first T20. If they opt for a change, the offspinner Nyumbu might be worth trying out. Bangladesh (likely XI): Tamim Iqbal, Anamul Haque, Liton Das, Mahmudullah, Mushfiqur Rahim (wicket keeper), Sabbir Rahman, Nasir Hossain, Mashrafe Mortaza (captain), Al-Amin Hossain, Jubair Hossain and Mustafizur Rahman. Zimbabwe (likely XI): Sikandar Raza, Regis Chakabva (wicket keeper), Craig Ervine, Sean Williams, Elton Chigumbura (captain), Malcolm Waller, Graeme Cremer, Tendai Chisoro, Tinashe Panyangara, Luke Jongwe, and Neville Madziva.